On 10 December 1948, in Paris, the UN General Assembly approved the Universal Declaration of Human Rights. This charter re-affirms the universal nature of human rights and lays down the principle of the equal dignity of every person. By virtue of its history, its values, its culture, Paris was naturally destined to host this 9th World Summit of Nobel Peace Laureates, which focused in particular on the question of human rights. 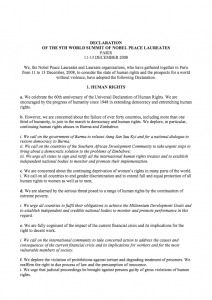 How to reinforce peace through the defence of human rights? Which strategies to pursue to consolidate the universal nature of fundamental rights? How to promote democratic values in the world, how to strengthen rights while removing social inequalities? A host of questions and challenges, calling into play our democratic values and their universality, and which was the focus of debates held during those two days. A celebration of these values, this Summit was an extraordinary opportunity to discuss and exchange views and to reflect on policies to be pursued to guarantee observance of the Declaration’s principles and further the push for peace in the world. Catarina Albouquerque (Independent Expert on human rights obligations related to safe drinking water and sanitation, Human Rights Council). Greetings by Tandiwe Chama, Recepient of the International Children’s Peace Prize 2007. 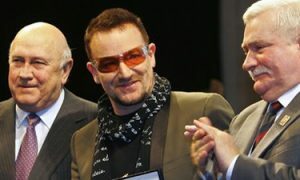 Bono, lead singer of U2, received the Peace Summit Award 2008, in Paris on 12 December, during the 9 World Summit of Nobel Peace Laureates. 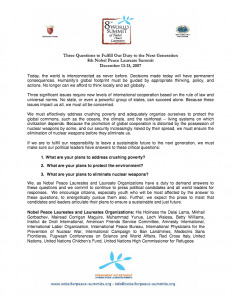 Bono was chosen by the Nobel Peace Laureates for his long-lasting engagement in the campaign for debt cancellation in third world Countries and for his efforts to raise public awareness of the Millennium Development Goals. Bono has participated in the founding of DATA (Debt, AIDS, Trade Africa), the anti-poverty advocacy organization created to press the governments of developed nations to do their part in the fight against extreme poverty in Africa, with a focus on debt relief, AIDS treatment and prevention and reform of unfair trade rules. Bono is also Co-founder of ONE, the association with which DATA merged in 2008, whose mission is to fight extreme poverty and preventable disease in the poorest places on the planet, particularly in Africa.